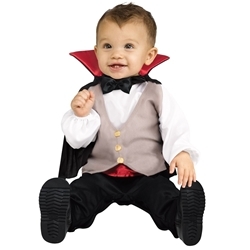 The Baby Dracula Infant Costume includes Jumpsuit, and Cape with Bow Tie. This costume is available in Infant Size 6-12 Months or Infant Size 12-24 Months. Move over milk, blood is on the menu for Baby Dracula! Dress your baby in this iconic Halloween Dracula Vampire look. Dress up in theme with your child with any of our many Vampire costumes and accessories to choose from. Together, you and your baby will own the night!